"The old Valencia Street Temple in San Francisco went through many changes of ownership. Through all the different businesses -- this picture remains in the second floor window (since early 70's)." 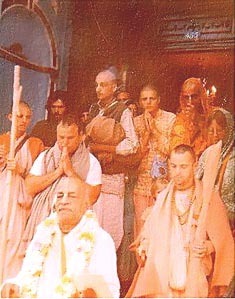 Click here to see a photo of Srila Prabhupada leaving the old Valencia Street Temple in 1974.